Erbium laser resurfacing is designed to remove surface-level and moderately deep lines and wrinkles on the face, hands, neck, or chest. One of the benefits of erbium laser resurfacing is minimal burning of surrounding tissue. This laser causes fewer side effects -- such as swelling, bruising, and redness -- so your recovery time should be faster than with CO2 laser resurfacing. In some cases, recovery may only take one week. Ask your doctor how long recovery is likely to take for you. Generally, laser resurfacing is an outpatient procedure, meaning there is no overnight stay. The doctor may treat individual wrinkles around your eyes, mouth, or forehead or treat your entire face. For small areas, the doctor will numb the areas to be treated with a local anesthetic. The doctor may also sedate you. You may get general anesthesia if your whole face is being treated. If the doctor is just treating parts of your face, the procedure will take about 30 to 45 minutes. A full-face treatment takes up to two hours. Following the laser procedure, the doctor will bandage the treated area. Starting 24 hours after treatment, you will need to clean the treated area four to five times a day. Then you'll need to apply an ointment, such as petroleum jelly, to prevent scabs from forming. This wound care is intended to prevent any scab formation. In general, the areas heal in 10 to 21 days, depending on the condition that was treated. It's normal to have swelling after laser skin resurfacing. Your doctor may prescribe steroids to manage swelling around your eyes. Sleeping on an extra pillow at night to elevate your head can help ease swelling. Putting an ice pack on the treated area also helps to reduce swelling in the first 24 to 48 hours after laser resurfacing. 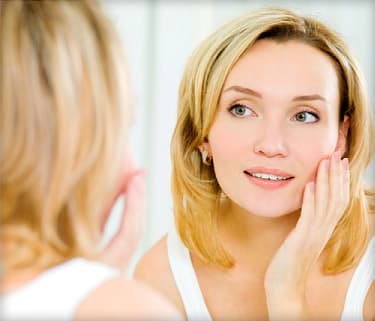 You will probably notice that your skin is lighter for a while after surgery. It is particularly important that you use a "broad-spectrum" sunscreen, which screens ultraviolet B and ultraviolet A rays, to protect your skin during that time. When selecting a sunscreen, look for one specially formulated for use on the face. It should have a physical blocker, such as zinc oxide. and a sun protection factor (SPF) of 30 or higher. Also limit your time in the sun, especially between the hours of 10 a.m. and 2 p.m. Wearing a broad-brimmed hat can help protect your skin from the sun's harmful rays. It is also important to keep your new skin well moisturized. If you use Retin A or glycolic acid products, you should be able to start using them again about six weeks after the procedure or when the doctor says you can. Once the treated areas have healed, you can wear makeup to hide the pink to red color that is typically seen after laser skin resurfacing. Green-based make-ups are particularly suitable for this camouflage since they neutralize the red color. Oil-free make-ups are recommended after laser resurfacing. The redness in the laser treated sites generally fades in two to three months. But it may take as long as six months for the redness to completely disappear. Redness generally lasts longer in people with fair skin. People with darker skin tones are more likely to get darker pigmentation. Using a bleaching agent before and after laser skin resurfacing may minimize that - as well as strict sun avoidance with use of a daily broad-spectrum sunscreen. In 2017, the average cost of laser skin resurfacing ranged from $1,114 to $2,124, according to the American Society of Plastic Surgeons. However, costs vary widely depending on where the procedure is being done and what areas are being treated. Because laser skin resurfacing is considered a cosmetic procedure, most medical insurance companies will not cover it. There may be an exception if you get the procedure to modify scars or remove precancerous growths on your skin.